It's nice to know what you're ordering, but also what you need from your leather. This diagram shows you which part of the cow is which! 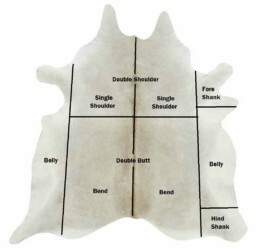 The shoulder/double shoulder area of the hide are some of the cleanest on the animal and are suitable for waist belts. The double shoulder we stock are trimmed, so your waste factor is very low. Bends are the very best area of the hide. They are also referred to as double bends or double butts. They're used a lot for bridle work because of their strength. If you purchase a single shoulder and a single bend (including the belly), this is almost always referred to as a side. The side will give you the longest length, if you need long straps.